If you like to listen to music or audiobooks a lot using your Android phone, you have likely encountered situations in the past where you received messages, calls or notifications but did not really want to look at the phone at that moment in time. Maybe because you were jogging and did not want to stop, or in a crowded place and you felt that it would be inappropriate to take out your phone. ReadItToMe is a Android application that can assist you in the majority of those situations. The apps’ basic feature is the option to read information to you if certain requirements are met. What those are? That’s up to you and definable in the program’s preferences. 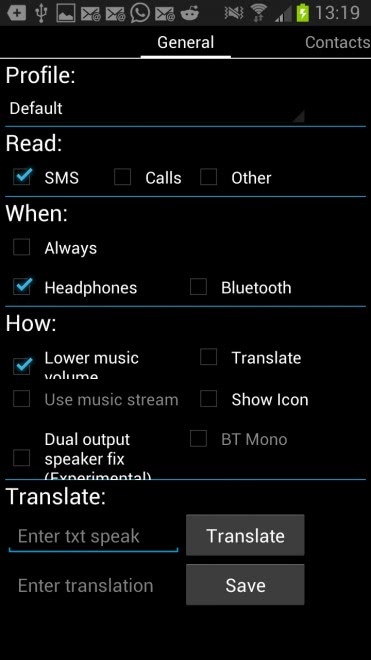 To give you one example: you can configure the application to read all SMS messages that you receive if headphones are connected to the phone, all Whatsapp messages when the phone is connected to Bluetooth (think Car), and even use it to reply to SMS with your voice after the message has been read to you.